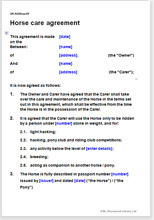 This agreement has been designed for situations in which a horse or pony is "retired" into the care of someone else. The horse may no longer be able to work owing to old age, or it might have suffered an injury, as a result of which it no longer can compete, but otherwise could be used for lighter work such as hacking or teaching, keeping another horse company or for breeding. In this agreement, the owner loans the horse to the carer for agreed purposes. The carer assumes all responsibility for the care of the horse (by default also including all costs such as farriery and veterinary charges), but does not pay the owner for the loan itself. Although this is a loan agreement (letting the owner end the agreement and take back the horse when he wants), there is provision for the ownership to pass to the carer after a given period if the owner does not end the agreement before that date. This provision allows the owner to become confident in the quality of care provided before abandoning the horse to the carer completely. Typically, this agreement would be used when an owner no longer wants to keep a horse but doesn't want to have it put down. By loaning it for free to someone who can use it, the owner retains ownership but doesn't have to pay care costs, while the carer can enjoy the horse and put it to use, only having to pay for care (and not the horse itself). This agreement could be put in place by either the owner or the carer. The owner benefits from establishing how the horse will be looked after and how it will be used, while the carer benefits from warranties (promises) about the condition and health of the horse. Using a legal agreement might seem overly formal when giving a horse to someone else to look after. However, the reason to do so is to record the agreement so that neither party can later claim that it was somehow different. Without having the deal in writing, there may be confusion later on as to who agreed to pay vet bills, or to whom the horse actually belongs. Arguments can be time consuming, expensive and can cause worry. There is no specific law relating to loaning your horse to someone else, so you are free to amend or add to the agreement as you want. "I have used your web site several times and fond it very quick ,handy,and very accurate many thanks."